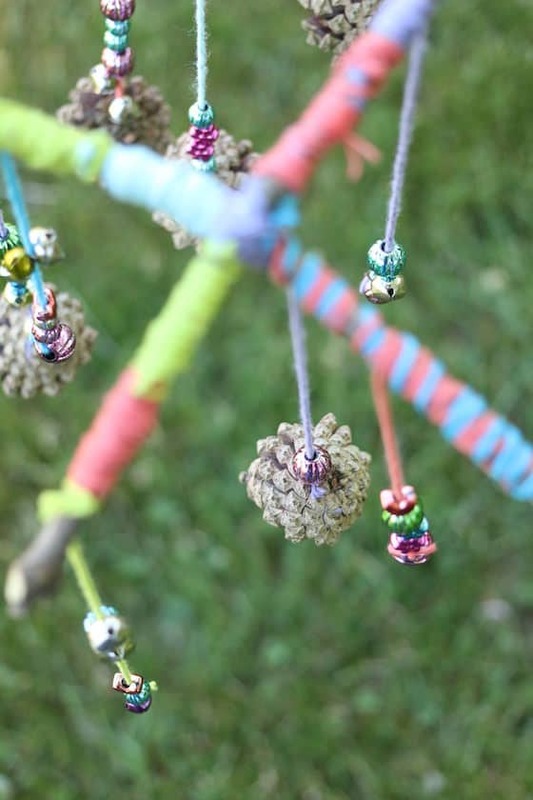 Kids can turn a collection of pinecones into a whimsical mobile for your backyard play space. If you have pinecones in your yard or neighbourhood, get out there and collect a bunch! 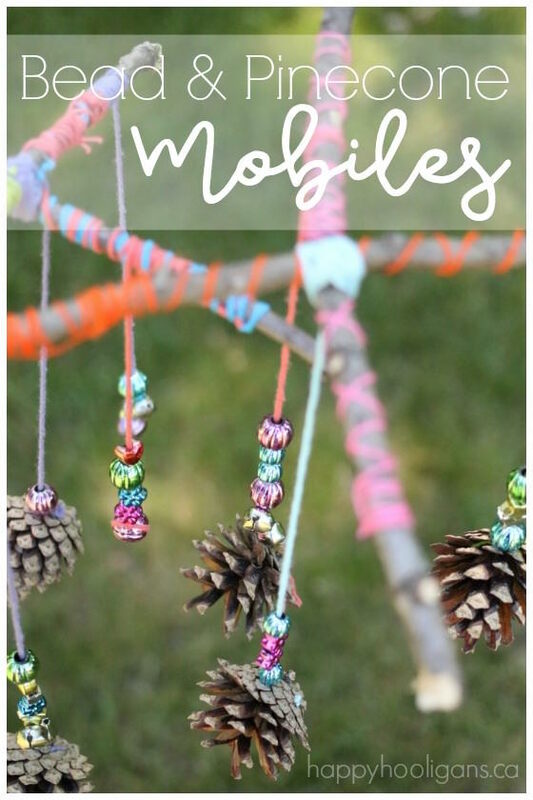 These natural pinecone mobiles are easy to make and the results are really gorgeous! 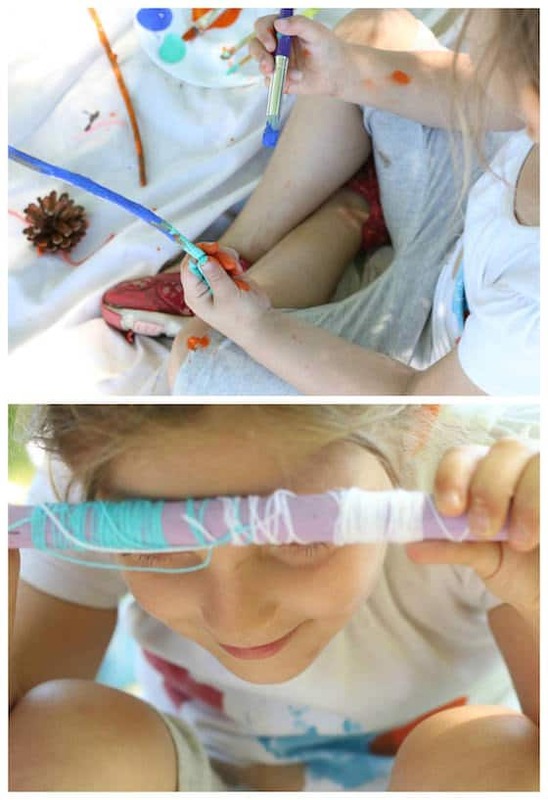 Kids of all ages will love this simple, nature craft. 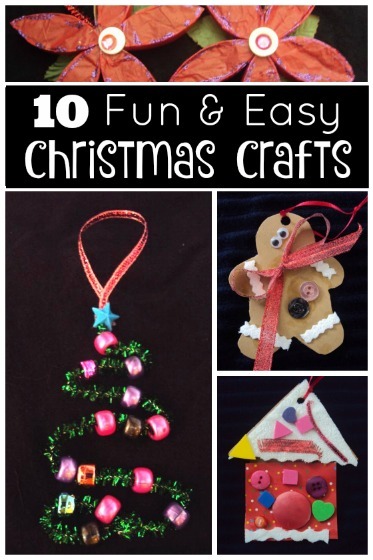 Hang them from a porch or patio, or bring them indoors and suspend them from the ceiling or the top of a window frame. 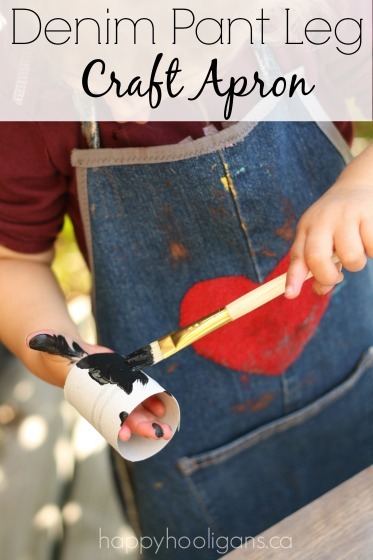 You probably know how much we love crafting with natural materials here in my home daycare. We also love making mobiles to hang in our play yard. Over the years, we’ve made all kinds of beautiful hanging ornaments using items we’ve picked up on a nature walk or while playing in our yard. 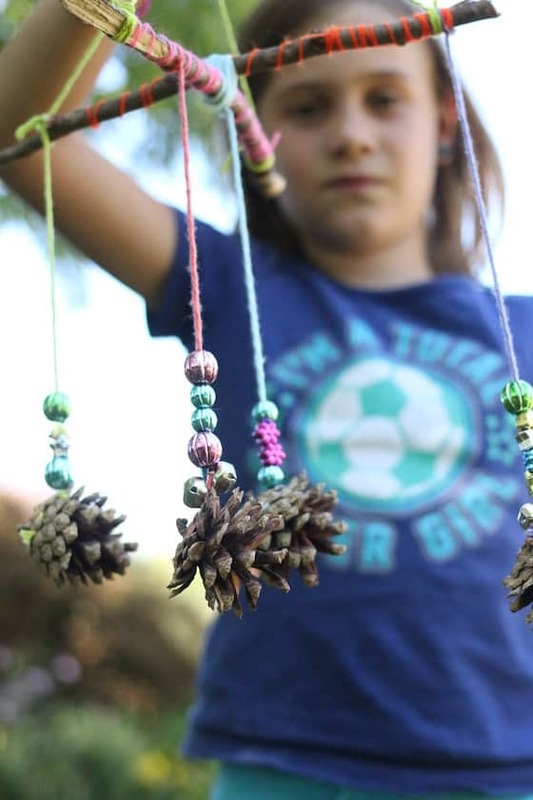 Our homemade wind chimes and our summer star ornaments are perfect examples. Crafting with natural materials is great for a couple of reasons. 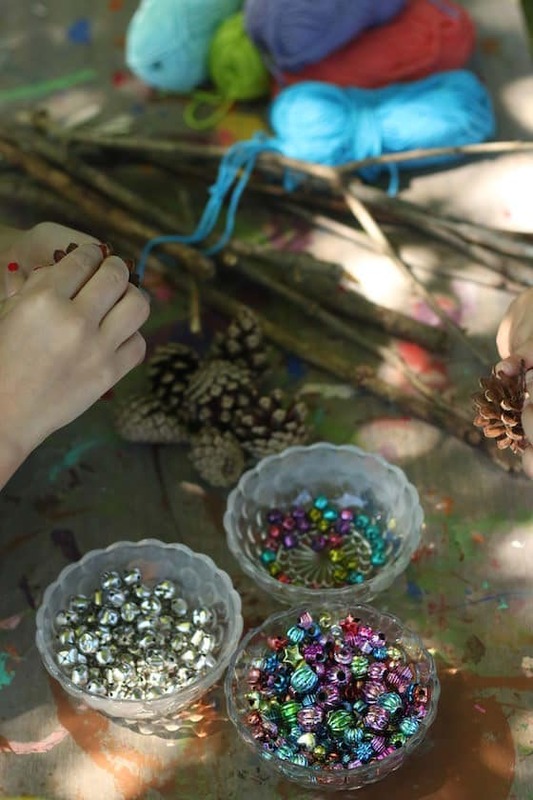 Firstly, when you craft with items found in nature, you keep your crafting costs down, and secondly, it puts kids in touch with their natural surroundings and the beautiful, little treasures that nature has to offer when you use items like pinecones, stones, sticks, leaves and flowers for your art and craft projects. We had a lot of fun collecting the materials for our mobiles today. And making the mobiles was a lovely creative process that offered lots of fine-motor opportunities. 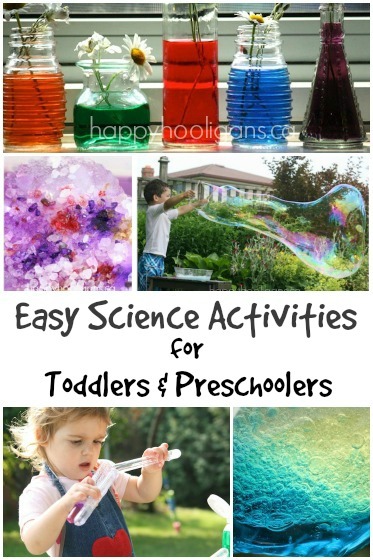 Older children will really enjoy the process, and can produce some very beautiful results. Younger children will enjoy collecting and exploring the materials, and if they’re too young to actually make a mobile, that’s ok. You’ll see, in the photos below that my preschoolers chose to craft with their finds in a more simplified way. 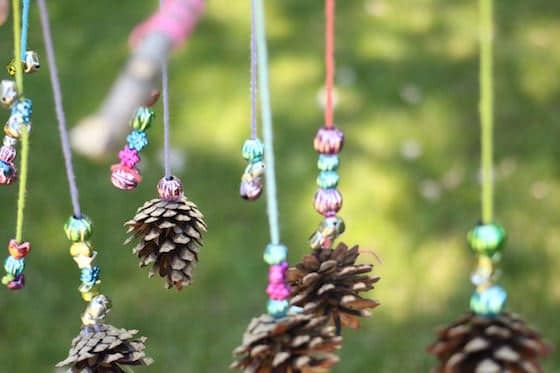 Ok, let’s get to it, and I’ll show you how to make some pinecone mobiles of your own! We started with a little nature hunt in our yard. We have a couple of pine trees at the back of the yard so pinecones are always plentiful at any time of year. We also searched our stick pile for sticks that would be a good size to make our mobiles with. We went with sturdy sticks about the same diameter as my pointer finger. You want your sticks to be thick enough that they won’t snap easily. To make the hanger for our mobile, we first wrapped colourful cotton yarn around our sticks, knotting it at beginning and end, and trimming off any tails of yarn. 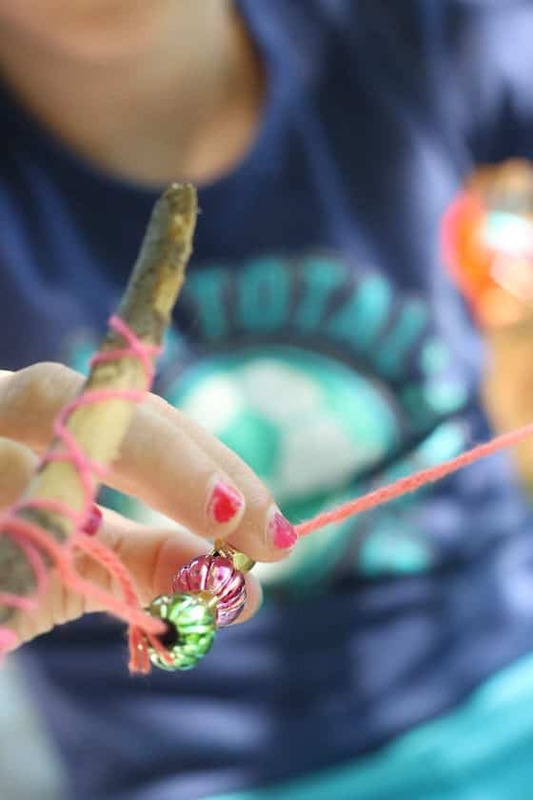 Then we criss-crossed a couple of sticks to form an “X”, and we secured them in place by winding more yarn around the sticks where they intersected. I’ll interrupt here to show you what our youngest hooligan did with her sticks. 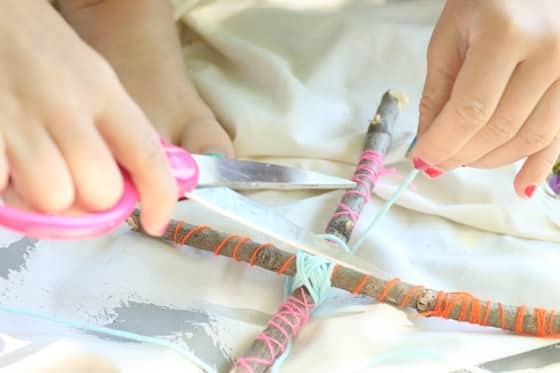 She chose not to make a mobile, but instead, to paint her sticks and wrap them with yarn. 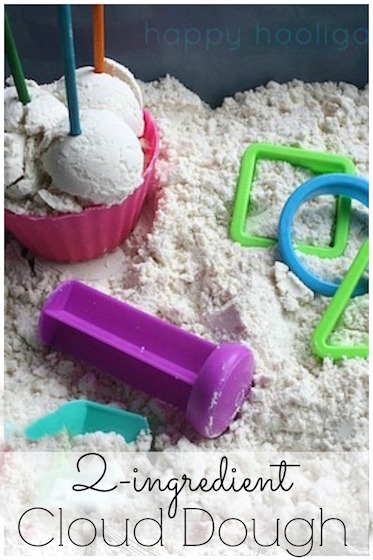 If your child decides that they don’t want to make the craft you have planned, relax and go with the flow. Kids will often chose to do something that’s better suited to their interests and abilities, and that’s fine. 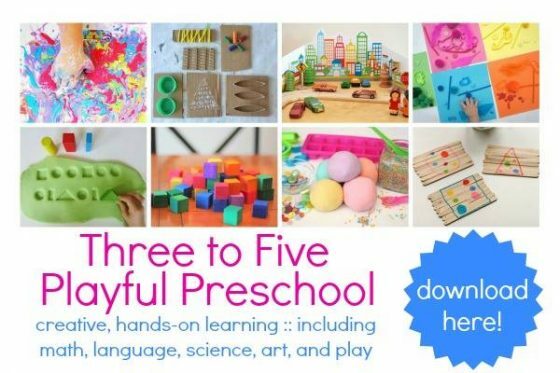 They still get the opportunity to express themselves creatively and to develop certain skills, but most importantly, the craft time will be a happy and enjoyable time for them, and ultimately, that’s the goal. It’s not important that they make what you want them to make but that they develop a love for art and crafting and that they practice new skills and strengthen skills they already have. Forcing a child to make what you’ve planned doesn’t make anyone happy. Once she had her sticks secured in an “X”, she tied various lengths and colours of yarn to her sticks, allowing them to dangle down below the X. You want to make sure that these pieces of yarn are quite long because you’re going to use up some of that length attaching your pinecones. 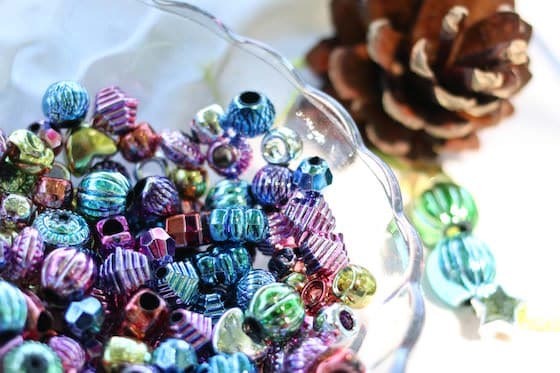 Before attaching the pinecones to the lengths of yarn, we strung a few colourful, metallic beads onto the yarn. To keep the beads from sliding off, we knotted the yarn underneath the last bead, leaving a good tail of yarn several inches in length. To attach the pinecones to the sticks. we simply wrapped the tail of yarn around the pinecone a few times, weaving it in and out, making sure the yarn was snugly trapped between the scales. When all of the pinecones were attached, we tied a length of yarn to the intersecting sticks, and our pinecone mobiles were reading for hanging. The hooligans took their pinecone mobiles home, and I hung mine on our back deck. I love the splash of colour it adds to our outdoor space and the way the beads sparkle in the sunlight. They look very pretty but just be sure you leave plenty of the natural resources behind, remember the first duty of pine cones is to spread their seeds and to provide nourishment and shelter for animals, birds, insects and the soil. I have seen times when people have completely removed all the pine cones. 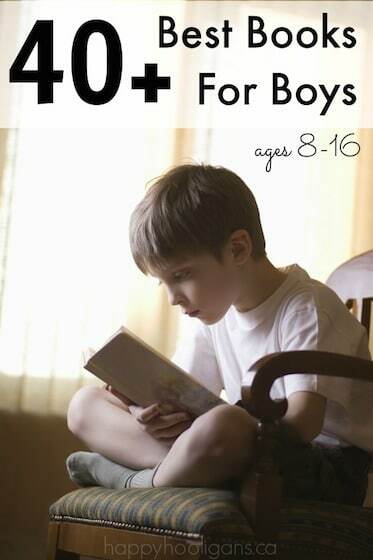 They provide a wonderful opportunity to teach many different concepts about the world around us. 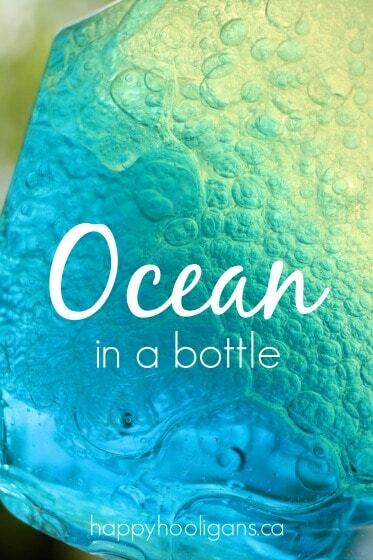 It’s good to learn when doing craft.